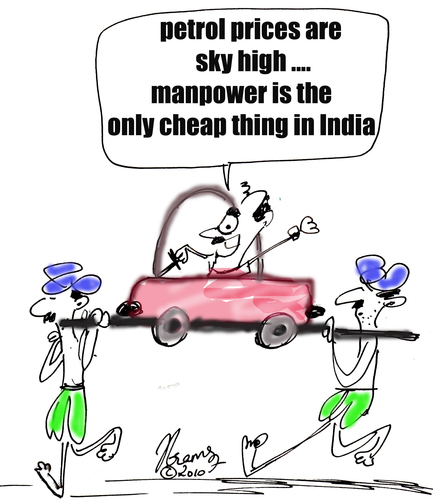 Indian Oil Corp. will raise petrol prices by Rs. 6.28 rupees per liter from Thursday, a company statement said on Wednesday, an attempt to compensate losses incurred by the state-run company to sell the fuel at subsidized rates. The price increase will exclude local taxes, it added. Earlier, a source in a different state-run company had said the gasoline price would be hiked. People have been shocked by the steep hike in petrol prices. The Indian government has announced a sharp hike of Rs 7.5 saying that the hike had become essential as the international crude price had gone up. The depreciation of Indian rupee against dollar has also been given as an excuse for the sudden and sharp hike in petrol price. After the hike, consumers will have to pay at least Rs 73.20 in New Delhi for a liter of petrol, while in Mumbai it will be sold even higher at 78.16, while in Kolkata one liter petrol will cost as much as Rs 77.53.